Many of the treeless upland areas of the UK are blanketed in heather, that turns the hills a subtle but beautiful shade of purple in the late summer as the plants burst into flower. However, despite the apparent wild visual appearance, the landscape is actually the result of human intervention. The land and heather is carefully managed, with large swathes being periodically cut or burnt. The purpose of all this activity is to generate fresh plant growth to provide an abundant food source for the Red Grouse in order to maximise the populations of these birds. 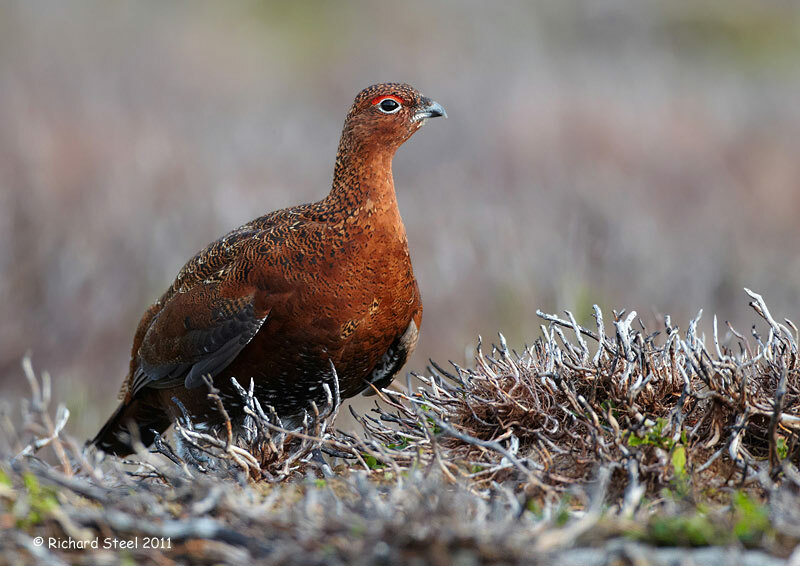 This is a bird amongst an area of heather that has been previously been burnt back. 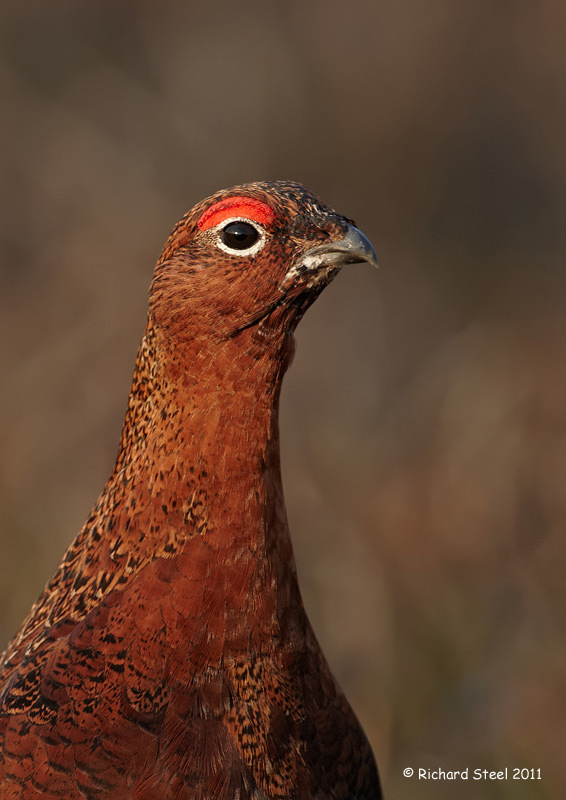 Unfortunately all this effort is to provide a good supply of birds for shooting with the hunting season starting on what is know as the 'Glorious 12th' (of August). 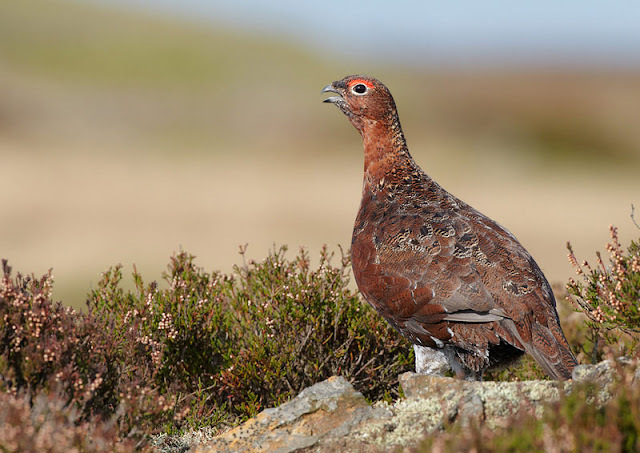 A further more distressing side of these practices is that many predators of the grouse have been historically and still are illegally persecuted by the game keepers through trapping, shooting or poisoning to maximise the number of birds available to the guns. This is one of the main reasons why the populations of Hen Harrier are in such a desperate state in the UK to the point where it is virtually extinct as breeding bird in the England. This year there was signs of only one pair of this majestic raptor possibly breeding. The Red Grouse is only found in the UK and is a sub-species of the Willow Grouse and is unique in that it does not develop the white plumage of the latter. For those not familiar with the bird and its slightly comical calls, here is a video I found on the web. 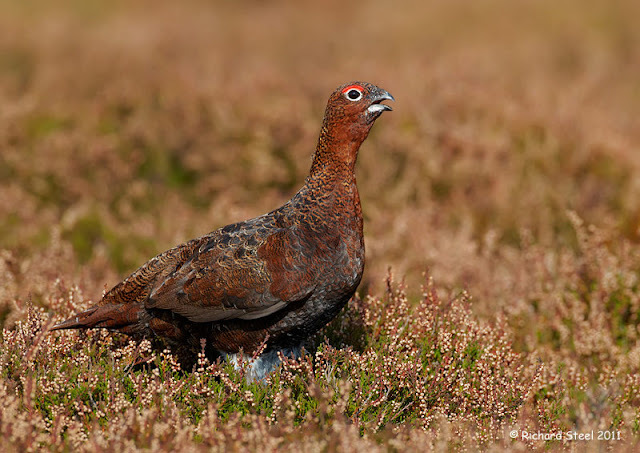 ( Red Grouse Video ). As you can see in this video occasionally you encounter a 'rogue' male which show no fear of humans and, fuelled by an excess of testosterone, can be quite aggressive towards people. From a photography perspective Red Grouse can be great fun and it is always a pleasure to be in the lovely landscape of these more remote upland areas in the company of a very endearing bird. At least it is when there is no horizontal rain! When you get up close to a Grouse your realise they are subtly very attractive birds with their finely patterned red-brown feathers, red eye 'combs' and 'furry' white legs and feet. 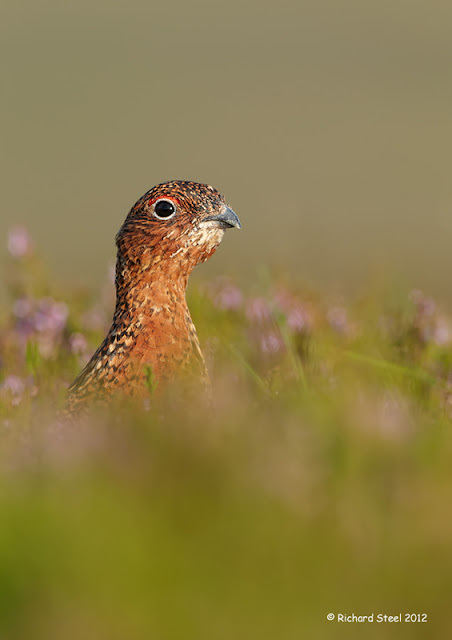 The heather creates a great setting for images especially when in bloom with the bird in amongst and photographed from a low angle of view. The birds have a habit of tending to perch and call from rocks or posts so often they stand proud of their surroundings which can also make for some interesting images. My closest Red Grouse populations are a two hour drive northwards and I tried to photograph them for the first time in October last year. It was a very successful visit but the purple of the heather by that time had faded to a pink-orange hue. I return again this August only to find that the heather had been delayed in blooming by the miserable, cold and wet summer we have had this year due to the southerly position of the jet stream. It was staring to bloom but not quite there. My main purpose for returning soon, possibly next week, is to try and get some flight photographs of these birds. This is no easy undertaking as they are very fast in the air, which is one reason why they are so popular with the hunters, and also there favourite direction for flight is usually away from you. I managed to get a couple of photographs last year but as any bird photographer will tell you there is always room for improvement. The next couple of weeks probably provide the best opportunity for achieving flight photos as the family groups disperse after breeding and the young males display to stake a claim to a territory. It will hopefully be a busy an interesting trip and it will be wonderful to be up in these remote hills once more surrounded by the incessant gurgling calls of these fascinating birds. Interesting post and super photos - neat bird. Such gorgeous photos!! We visited Scotland several years ago and traveled through the highlands. We were lucky: it was late in the fall but the heather was in full bloom. 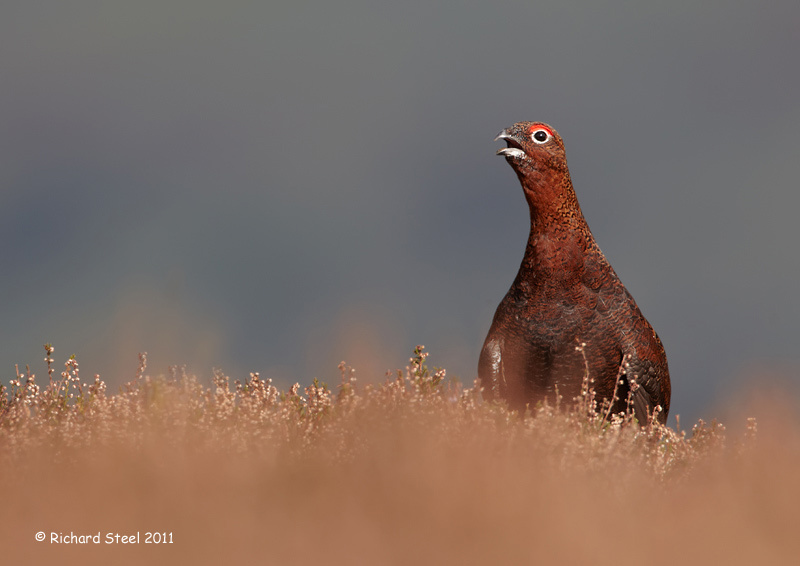 We never saw a grouse though. 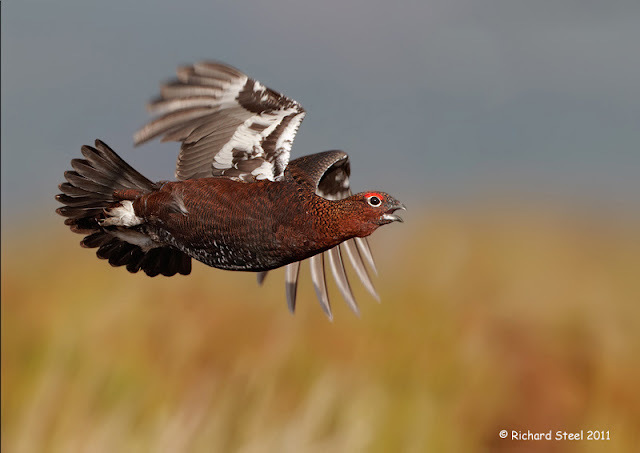 Beautiful images, I very much appreciate the information about the grouse, their habitat and the information about the Marsh Harriers. I hope it is not too late to save the Harriers. Very informative post. The photographs featured here are outstanding! 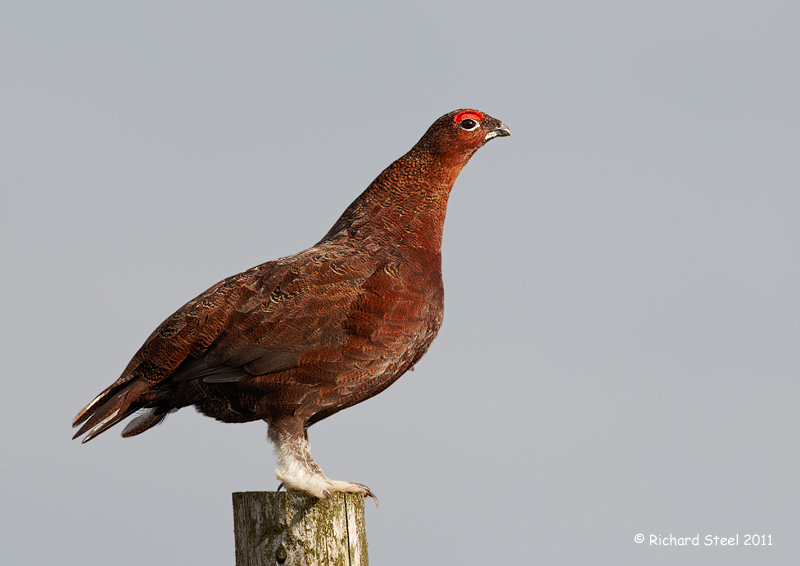 What a beautiful bird the grouse is! wow, it is so lovable, thanks for sharing! Thanks for the comments. 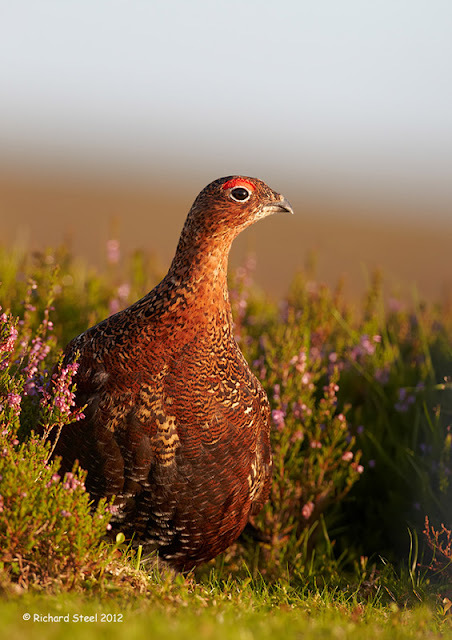 Apparently an early frost has killed off the heather blooms early so it looks like my plans for grouse in a purple 'mist' will need to be put on hold until next year. Cool bird and great photos!